Yellowstone national park is located in the state of Wyoming, USA. Small part of the park is spread in the states of Montana and Idaho too. The easiest and preferred way is to fly to the nearby cities of Jackson Hole, Wyoming or Bozeman, Montana. Though flying crossed our minds, we decided to do a road- trip. That would be fifteen to sixteen hours (from Bay area, California) on the road, behind the wheel. Though we had done similar length road trips previously (to Page, Arizona) this was our first, long winter road trip. So, is it worth spending so much time on the road? Well, absolutely… see for yourself. We drove across four states. Starting from Bay area California, we got onto I-80 East and drove the breadth of Nevada. Drove through the Idaho cities of Twin Falls and Idaho Falls and reached the small town of West Yellowstone in Montana. Freeways are well maintained in winter; salt and sand is scattered for traction. However, at places it is icy, especially at rest areas and gas stations. So all-weather/snow tires are necessary. The only problem we faced—foggy conditions at night after entering Targhee national forest. Slow driving is the only option then. Scenery is absolutely marvelous all along the way—endless vistas of white land, sometimes dry yellow bushes, snow covered mountains, occasional frozen water bodies, and beauteous hoarfrost tress sparkling in the sun. In winter, there are only two accommodations open within the park. And compared to summer, it is possible to get a room somewhat easily, but the problem is accessibility. Only the cabins at Mammoth are accessible by car. If you book your stay in the lodge near Old Faithful, there is no way you can drive to it. Snowcoach is the only transport to get to Old Faithful lodge. They do have snowcoach shuttles (operated for a price by Xanterra) to the hotel, but only from the north entrance. As of December 2015, there are no snow coach shuttles available from the west or south entrances of the park. One option is to arrange your transport to the lodge through private snow coach operators, which can be expensive. We stayed in Yellowstone lodge in the small town of West Yellowstone, Montana. It is just outside the west entrance of Yellowstone national park and is an easy get-away to the surrounding forests of Gallatin and Targhee. Yellowstone has five entrances, but in winter only the north entrance at Gardiner(Montana) is open to wheeled vehicles (through Mammoth Hot Springs to the park’s Northeast Entrance). Entering the park from other entrances is limited to snowcoaches and snowmobiles. So, you have to book a snowcoach or snowmobile tour to explore the various sections of the park. And since there are only a handful of concessionaires, I would recommend to book a tour way in advance. List of permitted snowcoach and snowmobile providers can be found here. From West Yellowstone, there are guided snowcoach/snowmobile tours to Old Faithful and surrounding geyser basins as well as Grand Canyon of the Yellowstone section. We did a full day snowcoach tour of Old Faithful with SeeYellowstone (Excellent. Recommended). With sub-zero temperatures (-30C / -22F) our first magical experience was diamond dust. A short description of diamond dust from Wikipedia – Diamond dust is a ground-level cloud composed of tiny ice crystals. Diamond dust generally forms under otherwise clear or nearly clear skies, so it is sometimes referred to as clear-sky precipitation. It is most commonly observed in Antarctica and the Arctic, but it can occur anywhere with a temperature well below freezing. At temperatures between 0 °C (32 °F) and about −39 °C (−38 °F) increasing the relative humidity can cause either fog or diamond dust. Followed by sun dogs. What are sun dogs? Read here; picture below. Steaming geysers. Since the temperature is so cold, the otherwise erupting water fountains are directly converted into steam. Hoarfrost trees. 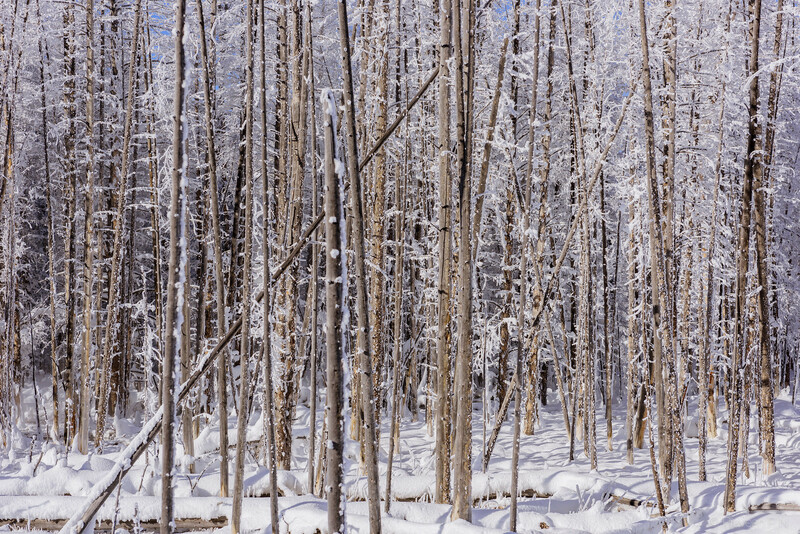 Early in the morning, deciduous trees in the forests are covered by ice crystals called hoarfrost. American bisons/buffaloes with their calves and other animals. To recapitulate, going to Yellowstone in winter is one of the most memorable experiences you will have. Go now! Winter conditions in Yellowstone start sometime in early November and last till February end (sometimes till early March). And while you are here, spend a day or two exploring the forests of Targhee and Gallatin on a snowmobile. Hover on the pic below and click on the arrow to view more pictures. Ya, plan a trip before winter ends. It’s truly amazing! ? Beautiful! Yellowstone is beautiful at any season, but it is truly unique in winter. I’ll have to try to get there sometime during the winter. Yes, you should try. I’m gonna try and visit in Autumn this year. ? Yellowstone in the winter is definitely a different park! I would love to try the snowmobile tour sometime. I’ve only been as far as Mammoth in the winter, but the crowds were smaller then. Yes, it is. I definitely want to visit Yellowstone again, probably during fall.